October 15, 2015 – On October 15, 1997, a seven-year journey to the ringed planet Saturn began with the liftoff of a Titan IVB/Centaur carrying the Cassini orbiter and its attached Huygens probe. 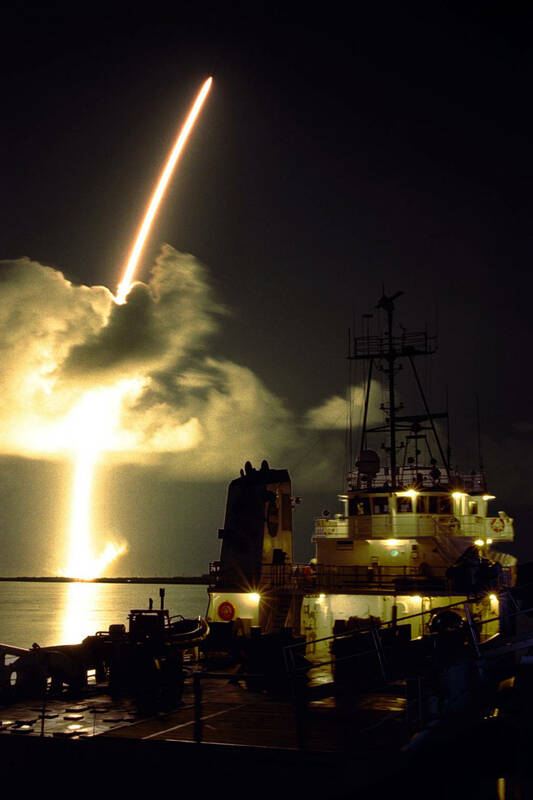 This spectacular streak shot was taken from Hangar AF on Cape Canaveral Air Force Station, with a solid rocket booster retrieval ship in the foreground. Launch occurred at 4:43 a.m. EDT from Launch Complex 40. After a nearly 2.2-billion mile journey, the spacecraft arrived in the Saturn system on June 30, 2004. Cassini completed its four-year primary mission in 2008 and went on to perform dozens more flybys of Titan, Enceladus and Saturn’s other icy moons, celebrating its 10th anniversary of arrival at Saturn in June 2014. The spacecraft has beamed back to Earth hundreds of gigabytes of scientific data, enabling the publication of more than 3,000 scientific reports. Cassini’s top accomplishments and discoveries include the Huygens probe making the first landing on a moon in the outer solar system (Titan); Saturn’s rings revealed as active and dynamic — a laboratory for how planets form; the first complete view of the north polar hexagon and discovery of giant hurricanes at both of Saturn’s poles, and the first imaging of vertical structures in Saturn’s rings. Cassini will wrap up its time in the region of Saturn’s large, icy moons with a series of three close encounters with Enceladus, which started on Wednesday, October 14, 2015. Images from the flyby will provide the first opportunity for a close-up look at the north polar region of Enceladus. Since Cassini’s 2005 discovery of continually-erupting fountains of icy material on Enceladus, the Saturn moon has become one of the most promising places in the solar system to search for present-day habitable environments. The Cassini-Huygens mission is a cooperative project of NASA, the European Space Agency and the Italian Space Agency. JPL, a division of the California Institute of Technology, Pasadena, manages the mission for NASA’s Science Mission Directorate in Washington. The Cassini imaging operations center is based at the Space Science Institute in Boulder, Colorado.